Welcome to the February digital release blog hop!!!! The hop will run for 1 week and end on Saturday 7th Feb at 12 Noon EST, when the lucky winners will be announced right here. Here is the card I created using a beautiful new image designed for Whimsy Stamps by Crissy Armstrong. 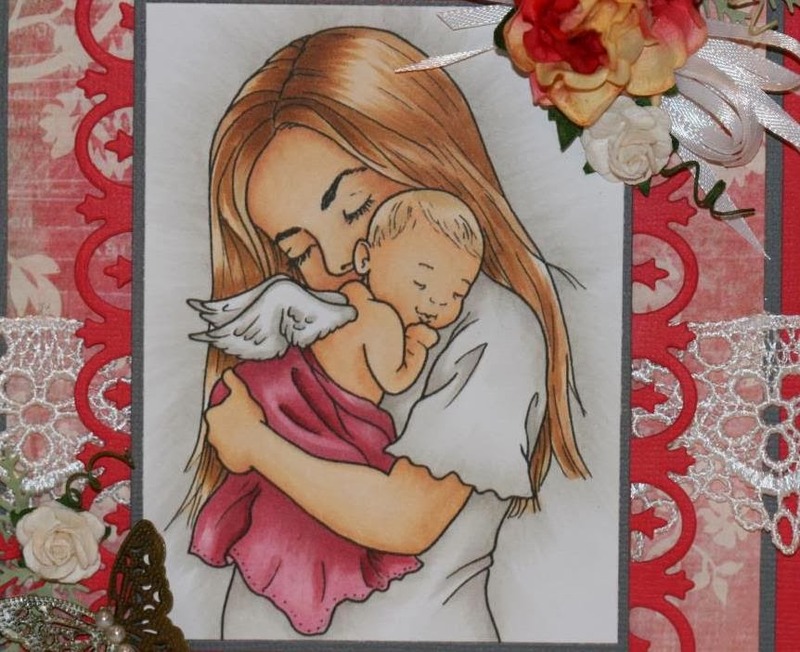 This image is called "Littlest Angel Mother", a wonderful stamp that would be great to use to make a card for someone who just had a new baby. I love this stamp it's so perfect for a new mom, cause being a mom is like a little piece of heaven,a little miracle. Supplies: Bazzill cardstock, Spellbinder- Fleur de Lis Rectangles, Offray ribbon and lace, Maya road butterfly, copic markers, miscellaneous flowers. I hope you have a wonderful day full of nothing but fabulous things. Simply GORGEOUS Charlene!! Your coloring is absolutley beautiful!! Aww love this Charlene. Nice colors and adorable image. Reminds me of my daughter too. You really excelled on her hair - it is shiny and textured just like real hair! Beautiful colouring and beautiful card - also beautiful story too! Thanks for sharing both! AAAWWWW....thank you for sharing your sweet thoughts about your daughter. I'm sure she knows how special she is to you, but hope that she has the chance to read what your wrote. Your card is absolutely beautiful. The coloring is gorgeous and the flowers are oh-so pretty. Beautiful card!! Such a wonderful image...after reading your story I can understand why you love it so much! This is absolutely beautiful. Crissy did an awesome job on designing the image & you did too on coloring it. This is beautiful. I just love the sweet image. Beautifully done. Love the flowers and the butterfly. I love this new group of vintage gals. Love to win this set. Thanks so much for the great cards.